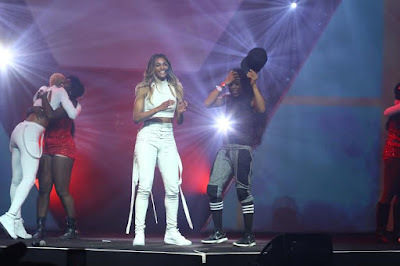 At Darey Art Alade's "Love Like a Movie 3" last night, Grammy award winner Ciara brought the house down at the Eko Hotel Convention Centre as the audience received an unexpected treat they will remember for a long time. Shortly after completing her final performance of the night, the R&B superstar invited Nigerian dance queen Kaffy onstage to teach her some popular Nigerian dance moves. For the next three minutes, the auditorium recorded its loudest noise of the night as Kaffy taught Ciara and her backup dancers how to dance to Iyanya's "Kukere", Tekno's "Duro" and Olamide's "Bobo" to the wild delight of the crowd. When it was over, the crowd screamed for more as Ciara reluctantly made her exit after leaving a huge impression on everyone.